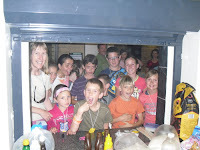 SubZero is our youth club for gr.4-7 and has been running for 10 years. To celebrate this we had an evening of boerie-rolls, pancakes, waffles and lots of games to celebrate. Although the weather was really wet, we did not let it dampen our spirits and a load of fun was had by adults and children. A big “THANK YOU” to all who helped and especially the ones who’ve been helping for the last ten years. May there be many more years of life change in our pre-teens!